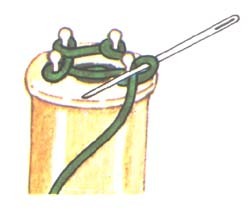 Spool Knitting (or Corking) is another method of making a knitted cord, like I-cord. 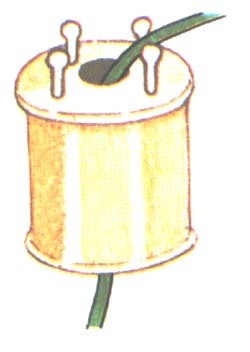 Use an empty wooden thread spool or a cylinder of wood with a 1/4 inch diameter hole through the center. Hammer 4 small finish nails (nails without large heads) at regular intervals around the center hole. Thread the end of a ball of yarn down through the hole, and hold in place with left hand while working. 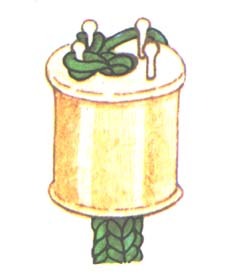 Wind the yarn in a counterclockwise direction around each nail. Working in a clockwise direction, take the yarn around the outer edge of the next nail and, using a tapestry needle or small crochet hook, lift the lower loop up over the yarn and over the nail. 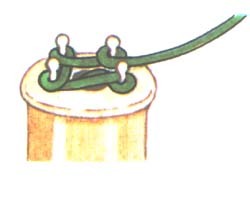 Continue working around each nail in this way, working in a continuous circle to form a tubular cord. To bind off, pass each loop over next nail in clockwise direction. When one loop remains cut off yarn, pass the end through the last loop and pull firmly.